Custom Connections: Ready to harness the full power of Advance Steel? Convert standard elements, such as beams, plates, special parts, folded plates, bolts, welds, features, weld preparations, etc. to intelligent Customer Connections. Combine several parametric joints together to create unique multi-joint situation saving the result to your Custom Connection library for reuse. 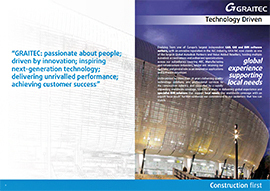 Learn how to get more performance from your Advance Steel by downloading your free copy of GRAITEC ‘Custom Connections’ tutorial from GRAITEC Advantage customer portal now!